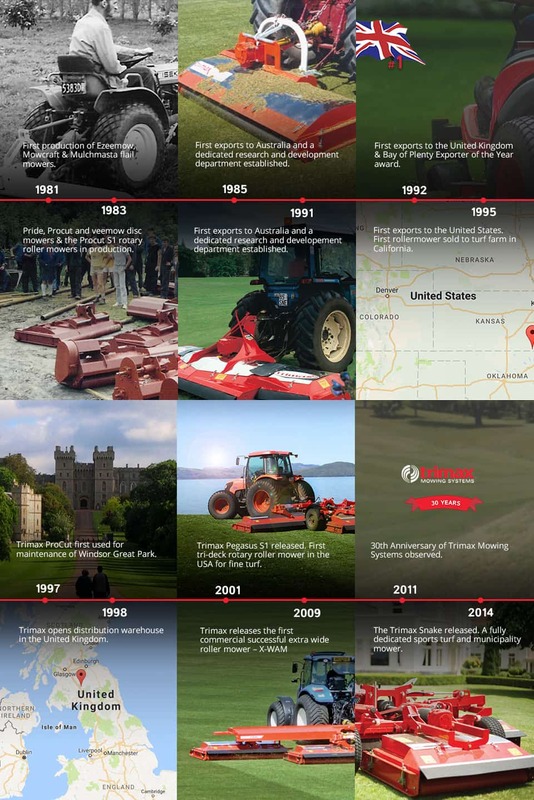 From humble beginnings in New Zealand to a world leader in commercial mowing – this is our story. 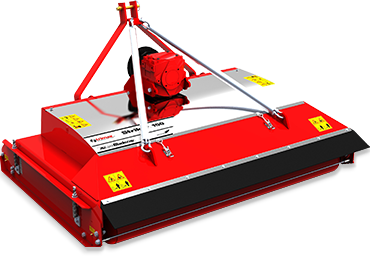 Trimax Mowing Systems is a family owned company that designs, develops, manufactures and distributes tractor-powered roller mower and flail mowing equipment. Our aim is to create mowing solutions which focus on low Total-Cost-of-Ownership and a long commercial life. We design products which are safe, efficient, intuitive to use and present consistently well in both fine turf and demanding commercial conditions. As a company we endeavour to treat all customers, staff, suppliers and partners as family. From our service and support, to product demonstrations and dealer engagement, we seek to deeply understand our family and provide innovative solutions to meet their needs. By continuing to listen to and partner with our family members we will continue to release consistently innovative and sustainable products to the world. 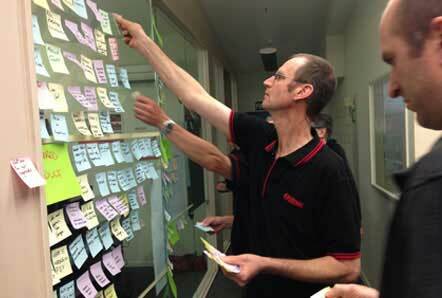 Here at Trimax we like to foster a culture of innovation and collaboration. We believe creativity is in all of us and that a focused team is a powerful force. When we join together as colleagues, partners and acquaintances, our joint creativity produces incredible designs, systems and solutions that would not be possible as separate entities. This inclusive ethos is central to our Trimax DNA and a solid contributor to our ongoing success. The birth of Trimax Mowing Systems had a lot to do with brown furry fruit. Modern kiwifruit production was pioneered in Bay of Plenty, New Zealand in the 1970’s. The area underwent a complete transformation in a decade. Large areas of cow pasture became kiwifruit orchards almost overnight and numerous businesses, big and small, competed to service the new industry. Trimax founder and owner Bob Sievwright trained in product engineering at General Motors New Zealand and with General Motors University in Flint Michigan. During the kiwifruit boom Bob innovated a new type of flail for mowers and shredders, however not long afterwards his plans went up in smoke, literally – Fire destroyed the mower factory that was using his new flail and Bob lost his only customer. Undeterred, Bob secured the flail mower manufacturing rights and bought a second mower-making shop. The new mowers and shredders fitted with his revolutionary GammaFlails™ were an outstanding success. Trimax then went on to join with Jim McEwen, owner of a small local engineering enterprise. 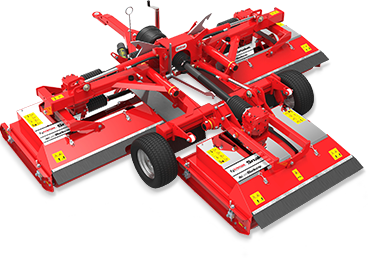 Jim’s range of advanced low-profile, multi-spindled rotary roller mowers called ProCut and his unique talent for blending style into functional mechanical devices heralded a new era for Trimax. Trimax began exporting in 1985. Although kiwifruit production was the launching pad for Trimax, rapid product development has resulted in the broad range of Trimax mowers you see today. From world class sports areas and golf courses to royal polo fields and estates, Trimax has delivered a powerful range of commercial products and a strong history of innovation. We’re proud of our extensive global expertise and dealer network which allows us to service customers as quickly as when Trimax was just a small operation. Trimax dealers are always able to call on our expertise to assist with technical advice and demonstrations if required, while owners and operators can expect the highest levels of backup and service, wherever they are. If you need a world class rotary roller or flail mower, mower part, technical service or support or have a special requirement please contact us at any time.